Black & Decker JE2400BD Fruit and Vegetable Juice Extractor is another truly affordable juicer that you can get below $50. This time it doesn’t really scream cheap just like the JE2060BL and the JE2200B. I can really sense elegance in this new design. Black+Decker JE2400BD is a one speed centrifugal juicing machine, limiting your ability to only juice hard fruits and vegetables and citrus fruits. While this may seem unfavorable if you’re a beginner you will find this machine just enough for common juice recipes. Don’t expect a durable construction with a cheap juicer, you really need to handle it with care. All the detachable parts are dishwasher safe for added convenience. The clear 28 oz pulp collector ensures continuous worry-free juicing. 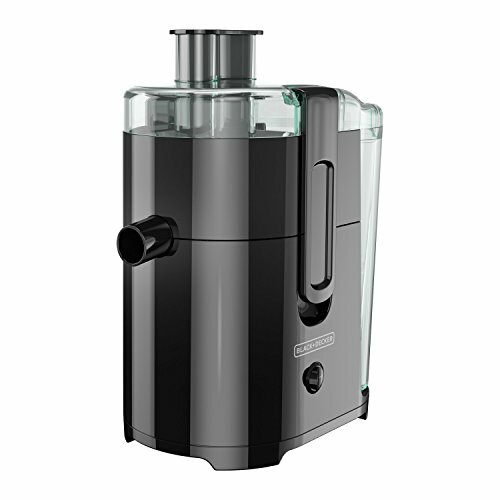 This juice extractor is pretty straight forward, assembly and disassembly is a breeze. However, since the chute is a little bit narrow compared to big mouth juice extractors you’ll have to chop your produce just like how you do it for slow juicers. This really defeats the purpose of being a fast electric juicer. All detachable parts of Black and Decker JE2400BD are dishwasher safe for easy cleanup. The pusher, food chute, cover, cutter/strainer, pulp separator, juice spout, and pulp container can be placed at the top rack of your dishwasher. If you prefer cleaning it manually use warm water and soap mixture then scrub off parts with residue build up. You only need to apply gentle pressure for the plastic parts, be extra careful with the cutter. I wouldn’t really suggest running the cutter in your dishwasher as it will make the blades dull. High-speed juicers are quite inferior when it comes to yield and efficiency and this juicing machine is not an exception. It produces a wet pulp that you’ll have to put back in the juicing chamber to avoid wasting nutrients. High RPM motor intensifies the oxidation process making your juice frothy. This is the reason why juice extracted from this type of juice maker only last for 24 hours. A one-speed centrifugal juicer can only process hard produce and citrus fruits efficiently. Hard produce such as cucumber, beets, apple, bitter gourd, pear, carrots, yakon, pepper, pumpkin, broccoli, fennel, watermelon, cauliflower, turmeric, sweet potato, garlic, celery, pineapple, asparagus, ginger and cilantro. Citrus fruits include tangerine, lime, orange, mandarin, grapefruit and lemon. It’s not recommended for juicing leafy greens alone such as kale, spinach, wheatgrass, etc., let alone making soy and almond milk. Black and Decker JE2400BD Fruit and Vegetable Juice Extractor is intended for beginners, you can process common fruits and vegetables with it. It’s easy to use and dish washer safe. However don’t expect it to be your everyday juicer, most specially if you want to include green juice in your juicing routine. Save up some more and get a good cold press juicer.